This is the first time that both water and a rocky surface - two "key ingredients" for habitable planets - have been found together beyond our solar system. Earth is essentially a 'dry' planet, with only 0.02% of its mass as surface water, so oceans came long after it had formed; most likely when water-rich asteroids in the solar system crashed into our planet. The new discovery shows that the same water 'delivery system' could have occurred in this distant, dying star's solar system – as latest evidence points to it containing a similar type of water-rich asteroid that would have first brought water to Earth. Astronomers at the Universities of Cambridge and Warwick say this is the first "reliable evidence" for water-rich, rocky planetary material in any extrasolar planetary system. They describe it as a "look into our future" as, six billion years from now, alien astronomers studying the rocky remains around our burned out sun might reach the same conclusion - that terrestrial planets once circled our parent star. The new research findings used NASA's Hubble Space Telescope and are reported today in the journal Science. All rocky planets form from the accumulation of asteroids, growing until full size, so asteroids are essentially the 'building blocks' of planets. "The finding of water in a large asteroid means the building blocks of habitable planets existed – and maybe still exist – in the GD 61 system, and likely also around substantial number of similar parent stars," said lead author Jay Farihi, from Cambridge's Institute of Astronomy. "These water-rich building blocks, and the terrestrial planets they build, may in fact be common – a system cannot create things as big as asteroids and avoid building planets, and GD 61 had the ingredients to deliver lots of water to their surfaces," Farihi said. "Our results demonstrate that there was definitely potential for habitable planets in this exoplanetary system." This debris, which "pollutes" the atmosphere of the white dwarf, can then be chemically analysed using powerful spectrograph techniques that "distill the entire asteroid, core and all", they say. The team detected a range of "elemental abundance" in the white dwarf's contaminated atmosphere – such as magnesium, silicon and iron, which, together with oxygen are the main components of rocks. By calculating the number of these elements relative to oxygen, the researchers were able to predict how much oxygen should be in the atmosphere of the white dwarf – but they found "significantly" more oxygen than if there were only rocks. "This oxygen excess can be carried by either water or carbon, and in this star there is virtually no carbon – indicating there must have been substantial water," said co-author Boris Gänsicke, from the University of Warwick. "This also rules out comets, which are rich in both water and carbon compounds, so we knew we were looking at a rocky asteroid with substantial water content – perhaps in the form of subsurface ice – like the asteroids we know in our solar system such as Ceres," Gänsicke said. Ultraviolet observations are the only way to obtain such precise measurement of oxygen levels in the white dwarf's debris – and that can only be carried out above the Earth's atmosphere. The "planetary bodies" such as these asteroids that fall into and pollute this dying star – which, in its heyday, was three times 'heavier' than our sun – also reveal that giant exoplanets probably still exist in this remote and withering system. "In order for the asteroids to pass sufficiently close to the white dwarf to be shredded, then eaten, they must perturbed from the asteroid belt – essentially pushed – by a massive object like a giant planet," added Farihi. "These asteroids tell us that the GD 61 system had – or still has – rocky, terrestrial planets, and the way they pollute the white dwarf tells us that giant planets probably still exist there. "This supports the idea that the star originally had a full complement of terrestrial planets, and probably gas giant planets, orbiting it – a complex system similar to our own." More information: "Evidence for Water in the Rocky Debris of a Disrupted Extrasolar Minor Planet," by J. Farihi et al. Science, 2013. "Earth is essentially a 'dry' planet, with only 0.02% of its mass as surface water, so oceans came long after it had formed;". Well, no. The 0.02 % figure is _with_ oceans, and early zircons shows an ocean ~ 4.25 Ga bp. Which with the upmoving date of the Moon is right after Earth formed @ ~ 4.4 Ga bp. In fact, the idea of post-formation delivery is also stressed by updates in Mars habitability, ~ 3.8 - 3.6 Ga bp. Not concurrent volatile delivery, correlated with Tharsis internal volcanism and anyway _after_ the late bombardment. If the late bombardment did not delivered water, why should the early bombardment do and why did such Mars water go into the crust just to return much later? Astronomers are a smart bunch. All they are doing is playing, and they get away with it. Few fields of research get so much free time to pursue work that achieves practically 0% beneficial return on investment. The article basically portrays a team of astronomers being paid to sit around and imagine what some abstract data means as the goal. Whatever they say will stand as truth for a long while, because no save another astronomer can disprove their imagination. Being that there is little practical meaningful value for the work, the #s of people who do this rather small, and they have limited telescope time so rather than disprove something, they work on their own fun. And the public is told this story telling is an achievement worth funding no matter how many times the story changes. So you're all for navel gazing, I take it? Pretending that there exists nothing outside our own (economic) field of view? How shortsighted can you get? There is a universe out there. 99.99999999% of which is inhospitable to life and with a plethora of objects that might wipe us out in a second. And you think spending a few bucks looking at that is a waste? I guess you also don't look when crossing the street. Waste of effort - right? Gaining knowledge requires investment. And I hate to bring this to you: but there is no known way in which we always arrive at 'right' conclusions from the very start. If you have one I'm sure the world will listen to it. They'd probably more than likely have formed ice giants like Neptune and Uranus. But there is the small possibility that there might've been an Earth there somewhere. Not sure if your beef is with astronomers, or with having "your" money being spent on something you don't like. Or maybe you just like to eructate controversy in a public forum. Would you care to define "benefit" in a way you believe most folks would agree with? Then we can apply it to all sorts of ways people spend your money (for instance advertising from companies whose products you buy). Wow. Sure is a lot of stuff for you to be unhappy about! Much more so that a modest group of astronomers. BTW, how much of your money do you think astronomers consume? I bet it's pretty small. Less, perhaps, than you would bother to stoop and pick up if you saw it lying in the street. How much water is there in our 'own' asteroid belt(s)? Can we transport (or 'guide') it to Mars for example to terraform the planet? why should the early bombardment do and why did such Mars water go into the crust just to return much later? Our chronology for Mars water is very limited. I don't think we have any evidence of what Mars was like farther back in its history, and our estimated dates are very sketchy. I expect to see major changes to our theories about Mars' climate history as we continue to explore and learn. We only know what we have seen so far. We might just not have found any evidence of ENORMOUS portions of Mars' climate history yet. Kinda like dinosaur fossiles here on Earth; we only find the ones that lived in places where mineralization happened. I'm sure we have much more to learn about past climate on Mars. I'm more inclined to believe that water is here because there are mountains. Warm air movements forced upward by the presence of a mountain range causes the air to cool and condense as rain. Glaciers run off mountains. The seas and lakes are fed water from higher elevations. We don't need disasters to appreciate this Good Earth. I wish. That would be interesting. But can you imagine the technology and the amount of time needed to do that? Damn.. I don't even think we're capable of doing that yet. @Sinister1811: Believe it or not, it may already have been done long ago in the history of this Solar System. Just take a look at Uranus' moon Miranda. It appears that it has been ice farmed. Those formations and scars on the surface do not look natural in the least. If you'll take a look at the amounts that would be needed - no way. Not at current tech levels (and given even the most optimistic technological advances not in the next few hundred years). Water alone won't terraform Mars in any case. Look at the atmosphere density there. You'd need to up that by a factor 100. (And find a source where the 70% nitrogen would come from, to boot). Yes, and you would end up with a poisonous atmosphere too. 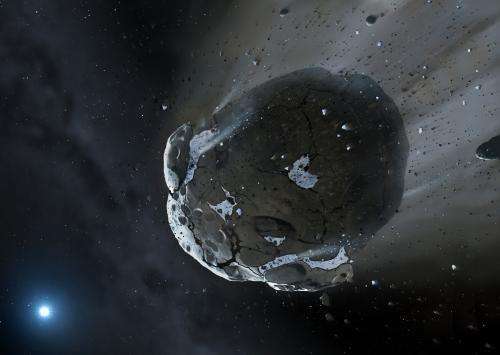 Bombardment by condritic asteroids would add water, but impacts vaporize rocks too. You would have all kinds of ash and vapor in the air. Also, the water you add would react with all the anhydrous compounds already there. The surface of Mars is starved for hydrogen, and it would react quickly with all the hydrogen you give it. All in all, you'd probably make Mars a complete mess, and even harder to live and work on. Even if you managed to get a thick atmosphere with some liquid water, it would probably be a giant mud hole. It's hard to say what the soil and atmosphere would be like. Also, there's no way around the fact that Mars is farther from the sun, and cold. All your water may still freeze at the poles.